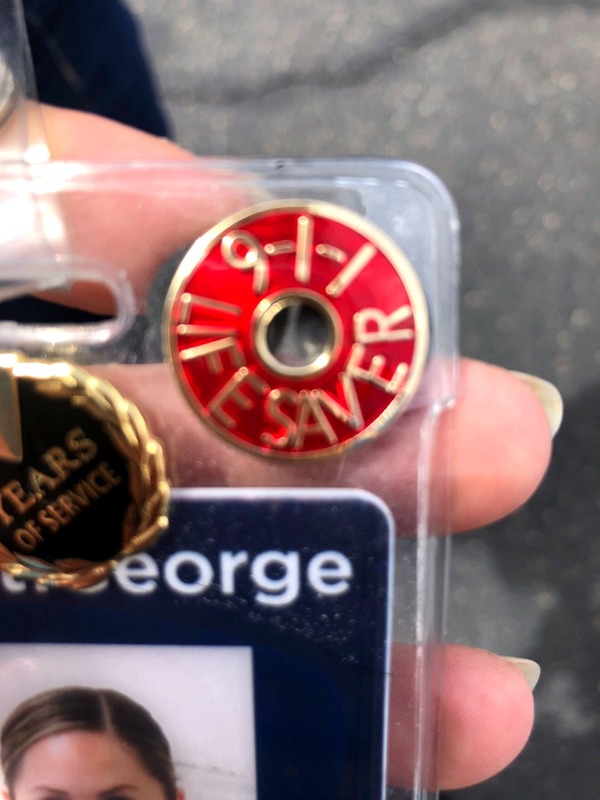 ST. GEORGE — A 911 dispatcher who answered an emergency call last November was honored Thursday for helping save a woman’s life when every second mattered. 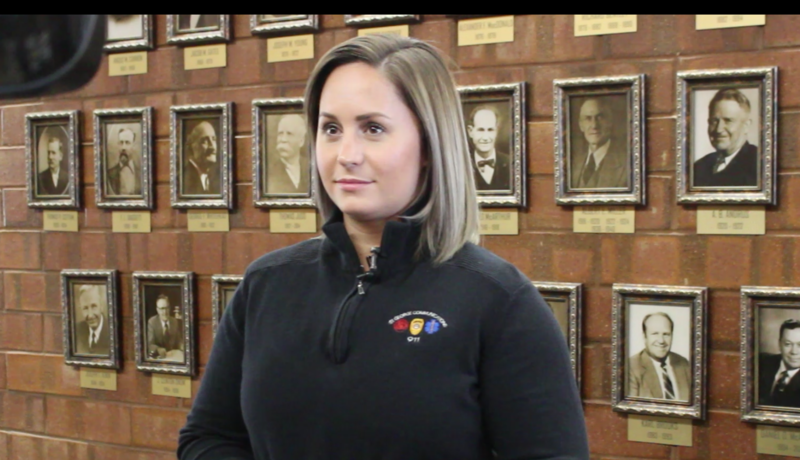 A group of nearly 50 individuals gathered in the St. George City Hall Council Chambers as the “911 Lifesaver” pin was awarded to Katie LeFevre, an emergency medical dispatcher at the St. George Communications Center. The award honored LeFevre for the manner in which she handled the November 2017 911 call involving a woman who was in cardiac arrest. “We thank her for her abilities and the job that she did – and she deserves recognition,” St. George Communications Manager Cindy Flowers said. The incident began Nov. 29, 2017, at the Washington County School District building during an afternoon district meeting that included principals from various schools throughout the county. 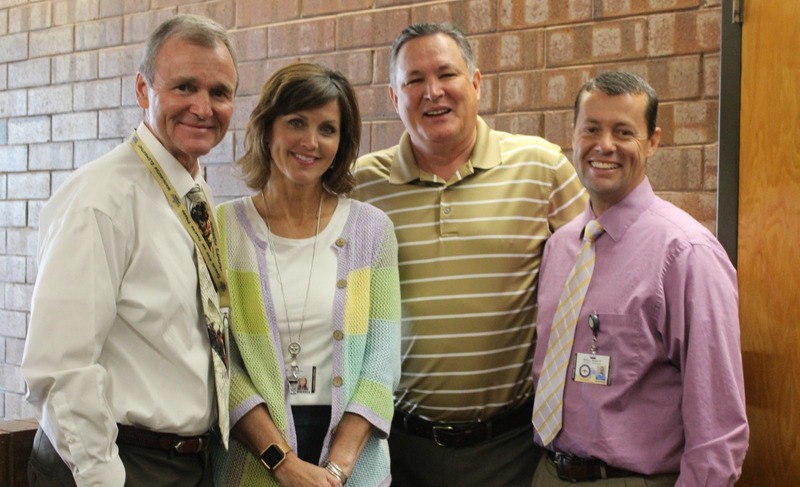 During the meeting, Amy Mitchell, principal at Red Mountain Elementary School, suffered a cardiac arrest. Also present was her husband, Kelly Mitchell, principal of Washington Elementary School; Adam Baker, principal of Heritage Elementary; and Little Valley Elementary Principal Rob Stevenson. At some point during the meeting, Amy Mitchell lost consciousness. “All of a sudden, her head went down on her computer and I knew she was in trouble,” Kelly Mitchell said. Several school officials called her name, and when she didn’t respond, Baker checked for a pulse, “and there was nothing,” Kelly Mitchell said. The meeting room was cleared and tables were moved to provide enough room to perform CPR on her, while Stevenson ran to get a defibrillator as the call was made to 911. Listen to clips of the 911 call in the media player top of this report. LeFevre, the emergency medical dispatcher that answered the 911 call, said it was a normal day and the call was a “standard call” at first, but that changed once it involved using the defibrillator, a portable device that checks heart rhythm and can send an electric shock to the heart to try to restore normal rhythm. It was her first call involving the use of the automatic external defibrillator, or AED, LeFevre said, adding that her training kicked in, and she followed the prompts programmed into the software used by the communications center and guided the group through the process of rendering aid until help could get there. Kelly Mitchell began CPR on his wife, assisted by Adam Baker, while Stevenson operated the defibrillator in an attempt to restart Amy Mitchell’s heart. Paramedics arrived within minutes and continued life-saving efforts before transporting her to the hospital. Amy Mitchell regained consciousness a few days later with no memory of the incident. Reflecting back, Amy Mitchell said before the incident, she felt great that day. She went for a run in the morning and then attended several meetings until the afternoon, when she was in the district meeting where the incident occurred. The AED machine had to be used three times before her heart started to beat on its own. Part of the treatment she received in the hospital included having a device implanted near her heart that will start the heart automatically should she experience a cardiac arrest in the future. As LeFevre reflected upon that day, she said she was fine while she was on the 911 call, but after it was over, she said her nerves were racked. The pre-training of the individuals who called 911 that day made for a good outcome, she said. Amy Mitchell also commented on the efforts of those involved that day. She said she’s grateful to all of the responders, including paramedics, dispatchers and those in the meeting. “Thankfully we have these well-trained people here in the St. George area that can make those calls and give us the help that we need,” she said. There were other positive outcomes as a result of the incident, Amy Mitchell said. “We didn’t have an AED machine at our school when this happened, but now we do” she said, referring to Red Mountain Elementary School. “Hundreds, if not thousands, of teachers and administrators have been trained to use the device,” Amy Mitchell said. 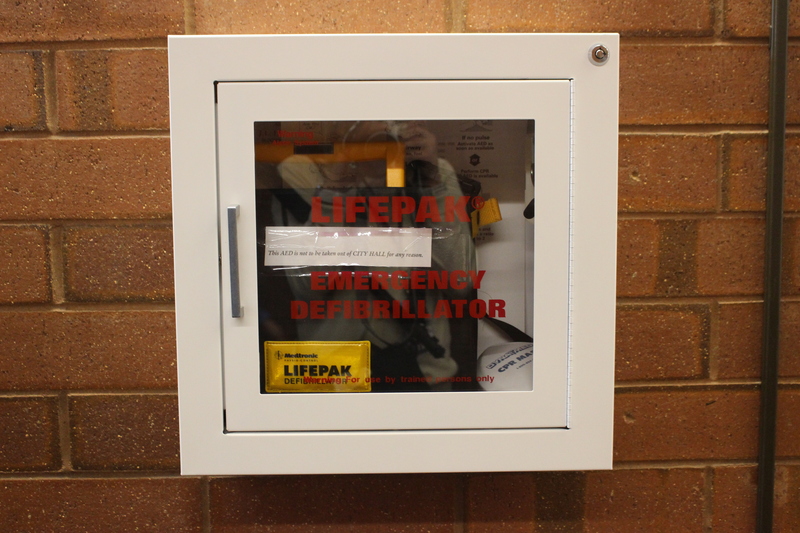 School officials have also purchased additional AEDs that are now installed in multiple schools throughout Washington County. Kelly Mitchell commented that the favorable outcome for his wife involved the heroic efforts of multiple groups, from the principals who sprang into action, to LeFevre’s skillfully guidance to the group, to the paramedics from Gold Cross who continued cardiac treatment during transport and to the St. George Fire Department for responding within minutes. “I thank God everyday that she’s still with us,” Kelly Mitchell said. What a wonderful job done by Ms. LeFevre, who is obviously a very well trained professional. Comforting to know she is there to help! absolutely…job well done. Amen to that !